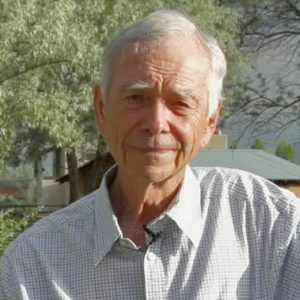 Allan Savory, born in Zimbabwe and educated in South Africa (University of Natal, BS in Zoology and Botany), pursued an early career as a research biologist and game ranger in the British Colonial Service of what was then Northern Rhodesia (today Zambia) and later as a farmer and game rancher in Zimbabwe. He served as a Member of Parliament in the latter days of Zimbabwe’s civil war and became the leader of the opposition to the ruling party headed by Ian Smith. Exiled in 1979 as a result of his opposition, he emigrated to the United States, where he continued to work with land managers through his consulting business. The growth of that business, a desire to assist many more people, and his recognition of the need to further his work led him to turn to the nonprofit world. In 1992 Savory and his wife, Jody Butterfield, formed a non-profit organization in Zimbabwe, the Africa Centre for Holistic Management, donating a ranch that would serve as a learning site for people all over Africa. His book, Holistic Management: A New Framework for Decision-Making, describes his effort to find workable solutions ordinary people can implement to overcome many of the problems besetting communities and businesses today.